Barry Levinson's Oscar nominated 'Wag The Dog' is a hilarious political comedy of reality, justice and special effects! Robert De Niro and Dustin Hoffman star as the spin doctor and the film producer. 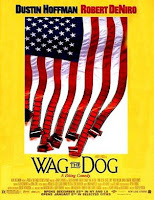 When 'Wag The Dog' was released in the US it coincided with the latest Clinton political scandal. When the conflict in the gulf region looked like a distraction to the president's image problems, life seemed to be mirroring art. For in the film we find that a political scandal is about to erupt - less than 2 weeks before Election Day! Less than two weeks before Election Day, a scandal erupts that threatens to cripple the President's bid for a second term. But before the incident can cause irreparable damage, a mysterious fixer is called to the White House. The ultimate spin doctor, Conrad Brean (Robert DeNiro) has the uncanny ability to manipulate politics, the press and most importantly, the American people. Anticipating the reaction of a frenzied press corps, Brean deftly deflects attention from the President by creating a bigger and better story a war. With the help of Stanley Motss (the t" is silent), a famed Hollywood producer and his irreverent entourage, Brean assembles an unlikely crisis team who orchestrate a global conflict unlike any ever seen on CNN. The eccentric Motss is played by Oscar winner Dustin Hoffman. Wickedly fictional with historical overtones truer than many care to admit, 'Wag The Dog' examines the blurred lines between politics, the media and show business. A good watch it is.